AOA Cleaning & Restoration is a restoration and cleaning company serving both residential and commercial properties in Northern NJ. They specialize in disaster recovery and mold removal, particularly after water/sewage damage. They came to us needing a website that was able to tell visitors exactly what they did, and to better compete with franchises like SERVPRO. 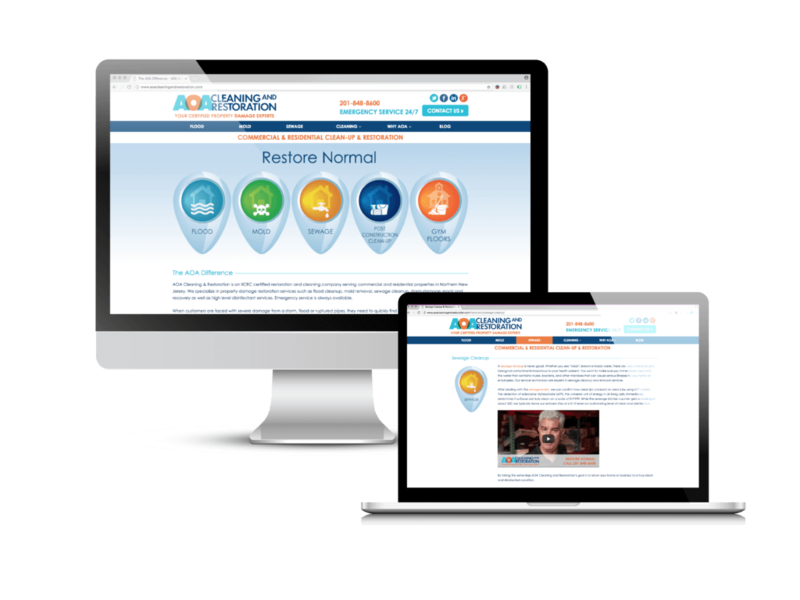 We launched a redesigned, updated website in 2014 that was mobile friendly and optimized for Search Engines. Since then we’ve continued to work with ondemandCMO to update content (including both blogs and videos) on the website. We’ve created and managed Facebook and Google Ads as well as other local content-based advertising, manage their email campaigns, as well as rearranged content for better flow and focus. We are continually looking to optimize the website, so it works at explaining their different services to their different audiences. We have created and managed a website that serves as the base of their online presence. It makes it easy for leads to contact them for the service they are interested in, as well as helps establish them as industry leaders through the variety of educational content that we create.